ST. PETERSBURG, Fla. -- Minor League Baseball today announced its list of Top 25 teams in licensed merchandise sales for 2014, with the combined totals of all 160 teams setting a Minor League Baseball record with more than $60.3 million in retail sales. The $60.3 million total marks an 8.8 percent increase over 2013's total of $55.4 million in retail sales, which had been the second-highest total recorded since Minor League Baseball's licensing program began in 1992. The previous record was $60 million in sales, set in 1994. The totals are based on total licensed merchandise sales from January 1 - December 31, 2014, and include the 160 teams in the domestic-based leagues that charge admission to their games. Alphabetically, the list includes: the Akron RubberDucks, Albuquerque Isotopes, Birmingham Barons, Carolina Mudcats, Charlotte Knights, Columbus Clippers, Corpus Christi Hooks, Dayton Dragons, Durham Bulls, El Paso Chihuahuas, Fort Wayne TinCaps, Indianapolis Indians, Lake Elsinore Storm, Lehigh Valley IronPigs, Louisville Bats, Portland Sea Dogs, Quad Cities River Bandits, Reno Aces, Richmond Flying Squirrels, Rochester Red Wings, Sacramento River Cats, Salt Lake Bees, Toledo Mud Hens, Trenton Thunder and Wisconsin Timber Rattlers. "The Top 25 list reflects the popularity of Minor League Baseball team names and logos across the country," said Sandie Hebert, Director of Licensing for Minor League Baseball. "The fact that nine of the teams on this year's list were not on the list last year shows that teams are keeping their logos creative, fresh and most of all, fun." Online sales have also played a significant role in the steady growth of merchandise sales, as Minor League Baseball experienced a 17.6 percent increase over 2013. "Our consumers are taking advantage of the opportunity to buy Minor League Baseball merchandise online and at the ballpark," said Hebert. "Our clubs reported online sales in all 50 states and several foreign countries, highlighting Minor League Baseball's popularity across the country and abroad." Of the Top 25 teams, 24 have online stores using the MiLB platform. 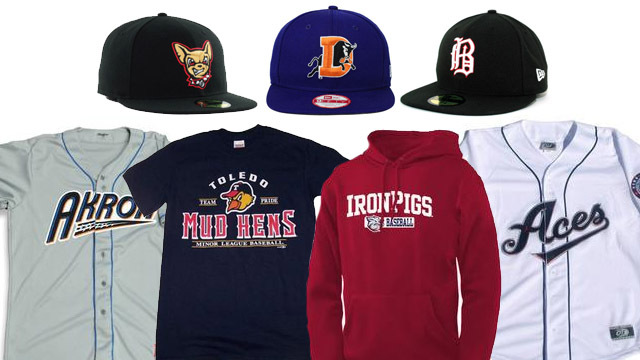 Visit www.MiLBStore.com to find merchandise from the Top 25 list of teams, and other MiLB teams.